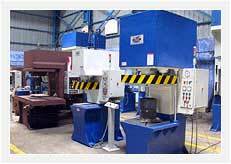 Proper selection of a hydraulic press for a particular application has prime importance. If you find it confusing to decide the set of specifications required, then consider the following points to arrive at a conclusion. Usually the tonnage required to do a job by hydraulic press is similar to that of mechanical press. There is no real difference. However, the tooling is usually interchangeable. There may be certain applications like deep drawing where the full power stroke of a hydraulic press reduces the tonnage. But, there are no known instances where using a hydraulic press requires more tonnage. Often, selecting press tonnage in the typical press room is little more than guesswork. As for example, a job is successful on a 100-ton mechanical press. The job may never have been tried at 75 tons or at 50 tons. With a hydraulic press, tonnage can be quickly and easily adjusted, tuning the press to precisely the right tonnage for each specific job. The effect of the stroke on the work is almost same as with a mechanical press in most cases. However, there are some specific limitations. Drop hammers and mechanical presses do a better job on soft jewelry pieces with sharper coining action. However, the full power stroke of the hydraulic presses produce significantly better results in actions like deep drawing, etc. Otherwise there are very few examples where the application of 100 tons of hydraulic force produces any significant difference. Depending upon the end-requirements, press selection type is chosen. As for example, open-gap presses provide easy access from three sides. At the same time, 4-column presses ensure even pressure distribution. Additionally, straight-side presses offer the rigidity required for off-center loading in progressive die applications. Several other factors also play important role in deciding the type of press. For example, more critical the work and the more demanding the tolerances, the greater the reserve tonnage capacity should be.